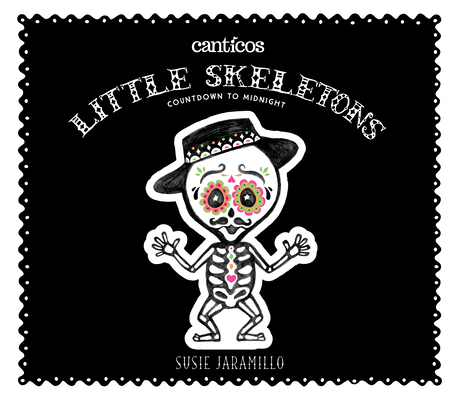 Little Skeletons/Esqueletitos: Countdown to Midnight is the 5th book from the Canticos collection. 2018 International Latino Book Awards winner for Best Latino Picture Book. This book is based on the song "Los Esqueletos Salen de la Tumba" (The Skeletons Come Out of the Tomb) . With Mexican-inspired black and white hand drawn art, it is a festive Halloween and Day of the Dead celebration. This book has been included in the 2018 Tejas Star Reading List. Inspired by beautiful calavera art by Jos Guadalupe Posada, this book is not just for kids. The hand-drawn art make this a great coffee table book for lovers of Mexican art. Concept: Telling time & counting from one to 12. A moveable clock at the start of the book will tempt little fingers to change the time along with the story. Book summary Follow the little skeletons as they go about their surprising and intriguing day while counting down from 1 PM to midnight. Susie Jaramillo Susie Jaramillo is a mom, an artist and a creative director raising two bilingual children. She worked for many years in advertising having co-founded the vox collective, a NY-based boutique multicultural agency where she served as Chief Creative Officer until 2012. She attended Pratt Institute in Brooklyn where she majored in painting and illustration. Susie Grew up between Venezuela and the United States, always going back and forth fluently between cultures. As a child, she was exposed to songs and traditions from both the United States and Latin America. To bring to life all the things she loved about her Latino culture she created Canticos and now kids of all ages can enjoy these nursery rhymes and songs! She lives in Brooklyn.